Check out this awesome story we found on Gizmodo. Tony Niclinkson a massive stroke in 2005 that left him completely unable to move or speak. Check Tony out on the handle @TonyNicklinson. Using special software that follows the movement of his eyes on a keyboard and using blinks allows Tony to convert each selection into text and speech. Despite this development, Tony’s story is pretty bleak. Living with a condition known as “Locked-in syndrome,” Tony is currently petitioning the High Court in the U.K. to let him end his life lawfully. 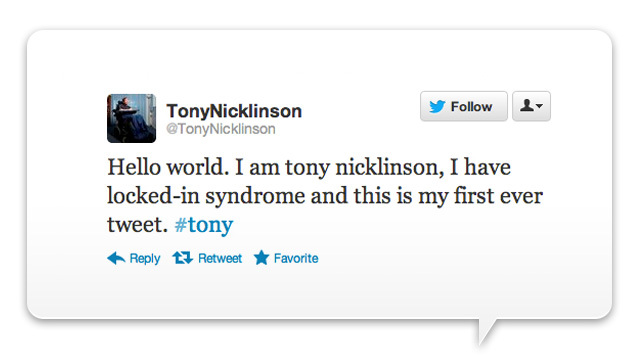 Maybe having this kind of access to the world through this new software will change Tony’s mind. I had not heard of this technology until I read this article. This is amazing. I would love to hear how Tony is doing today.